This structure rises above a corner of east London, with the Olympic Stadium in the near distance. 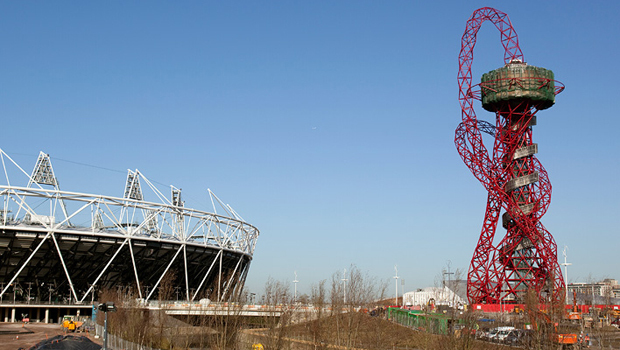 In fact, you’d think that the Strand East Tower is jockeying for position with Anish Kapoor’s ArcelorMittal Orbit, which stands outside the stadium, a complicated squiggle of metal. With its lattice of larch wood and steel supports, this tower is far more elegant and pleasing on the eye, with its handsome curves and upward sweep. I’d never noticed the tower before, but it’s now become a landmark on my journeys to the eastern parts of the city and beyond. Yes, it doesn’t take very long but packs a nice punch.